JAL will enhance services on Honolulu routes from Fall 2013. Image by Japan Airlines. Japan Airlines (JAL) announces that it enhance the services provided on Honolulu routes this fall as part of the JAL NEW SKY PROJECT, which aims to bring passengers a unique and completely refreshing onboard experience and provide service one class above the current standard. This is in addition to the already announced JAL SKY SUITE 767 (SS6) cabin refresh which will be rolled out to the Honolulu routes in 2014. According to Aviation Wire, JAL President Yoshiharu Ueki said these service enhancements are long overdue as competitions has intensified on the Honolulu routes. BEDD for Resort - seasonal autumn salmon with ginger-fried pork. Image by Japan Airlines. BEDD for Resort - Japanese beef fillet with special sauce périgueux. Image by Japan Airlines. As part of the JAL SKY PROJECT, JAL has created a dream team of culinary experts to create a fine dining restaurant up in the sky called JAL BEDD - SKY AUBERGE. Now JAL will open up a new branch of that restaurant for the Honolulu route called BEDD for Resort from September 2013. Celebrity chef Chikara Yamada who is in charge of the long-haul Business Class menus in the original JAL BEDD restaurant will be in charge of this special Business Class menu. 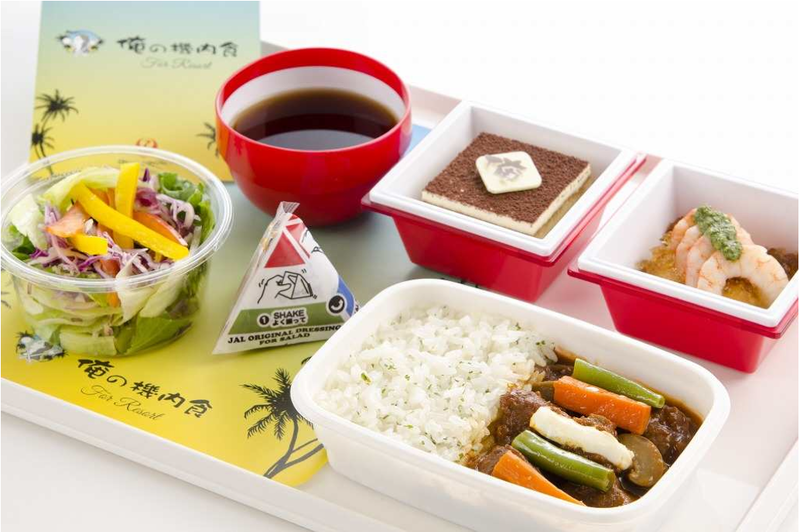 Business Class passengers flying from Tokyo Narita, Nagoya Chubu, and Osaka Kansai to Honolulu will be able to enjoy this new menu prepared by Chef Yamada from September 1 2013. The first installment will include seasonal autumn salmon with ginger-fried pork as the Japanese option and Japanese beef fillet with special sauce périgueux as the Western option. Due to the mid-night departure time, those flying from Tokyo Haneda to Honolulu will be served Blood orange Juice from Sicily with refreshing breakfast instead. 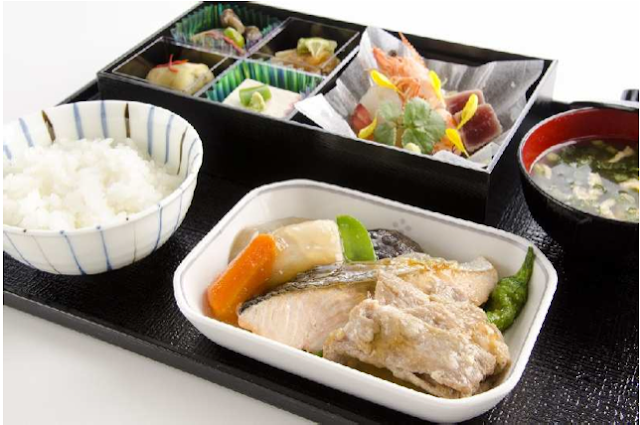 Ore-no Kinaishoku for Resort - special inflight meal in Economy Class. Image by Japan Airlines. 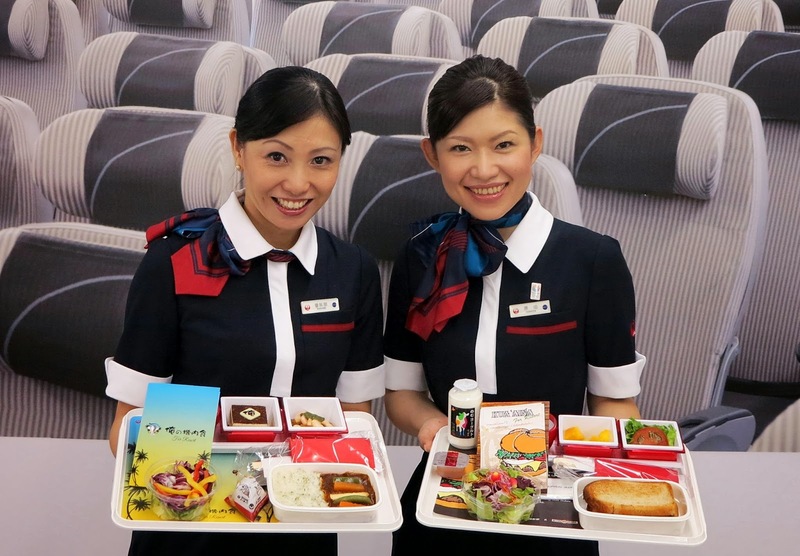 Similar to JAL BEDD, JAL also has opened a restaurant for Premium Economy and Economy Class as part of the JAL NEW SKY PROJECT called JAL KITCHEN GALLERY. And as part of the Honolulu route service enhancements, JAL will open up a special branch called "Ore-no Kinaishoku for Resort". As the name suggests, this is actually a collaboration between JAL and the popular Ore-no brand restaurants in Japan. Chef Kazuhide Nose, Chef of Ore-no French and Toshihiro Yamaura, Chef of Ore-no Italian have partnered with JAL to create the special menu inspired by popular dishes from their restaurants. 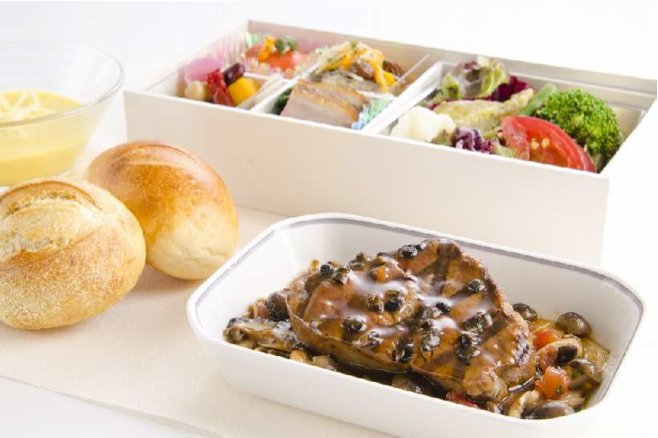 Between September and November 2013, Economy Class passengers flying from Tokyo Narita, Nagoya Chubu, and Osaka Kansai to Honolulu will be able to enjoy the Ore-no Beef Stroganoff designed by Chef Nose with Ore-no Zensai, Ore-no Salad with truffle oil dressing and Ore-no Sweets - Derramisu designed by Chef Yamaura. Between December 2013 and February 2014, the two chefs will switch position and have Chef Yamaura in charge of the main dish while have Chef Nose in charge of the sides and dessert. So we can expect the dishes to alternate between Italian and French. 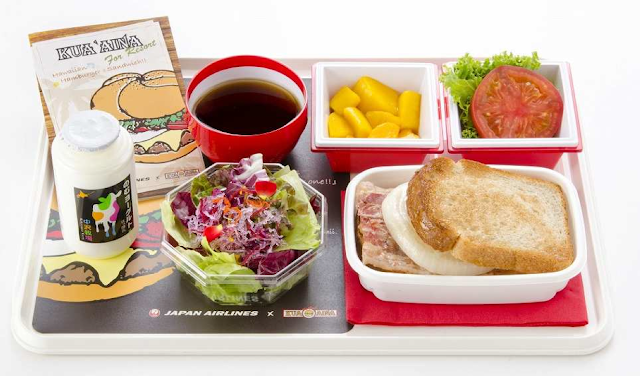 KUA ‘AINA for Resort - new breakfast menu on flights from Tokyo Haneda to Honolulu. Image by Japan Airlines. KUA ‘AINA for Resort - BLT sandwich with bread from Maison Kaiser. Image by Japan Airlines. The first installment will include the popular BLT sandwich from KUA 'AINA made with bread from Maison Kayser. Haven't heard of Maison Kayser? It's the French bakery JAL has been partnered with over the years. 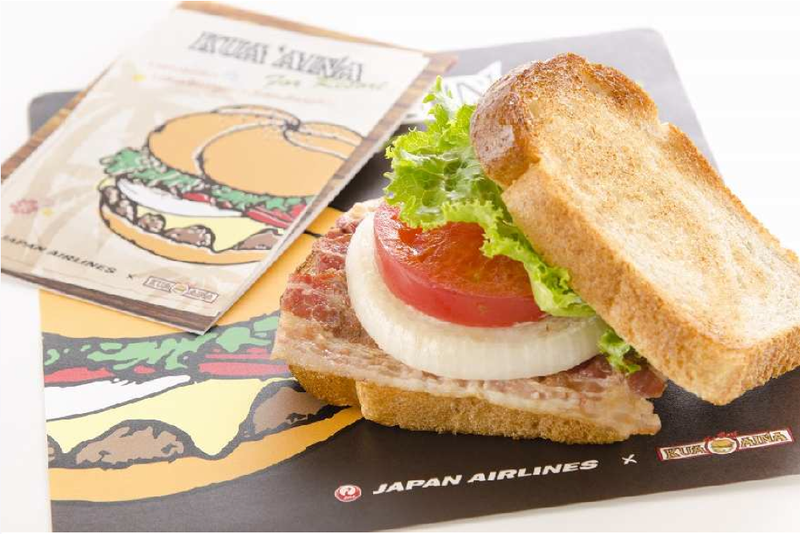 JAL has been serving breads from Maison Kayser onboard and on the ground at its lounges. Although it's not clear when this new menu will be served, I believe this service will start on October 1 2013, together with the new catering schedule (see below). As part of an effort to ensure passengers have a good night sleep, JAL will change its catering schedule on flights from Tokyo Haneda to Honolulu. Given the flight departs at 23:40, most passengers will simply want to go to bed after takeoff. So from October 1 2013, JAL will no longer serve meals right after takeoff. Instead, the enhanced breakfast from KUA ‘AINA for Resort (see above) will be served before landing. JAL will reserve 4 seats in the rear of the Economy Class cabin for ladies only. They can use this for nursing or put on makeup as long as seat belt sign is not on. According to Aviation Wire, these seats will be enclosed by curtains to provide privacy. This service is available from October 1 2013. JAL will expand picture books and toys on certain flights that are deemed most suitable for pre-school children from October 1 2013. This includes JL786 departing Tokyo Narita at around 19:00 and JL785 arriving Tokyo Narita at around 13:00. Up till now, JAL has been using the same background music during boarding and disembarkment on the Honolulu flights. However, in order to create a more resort-like atmosphere, JAL has invited Jake Shimabukuro, a famous ukulele artist from Hawaii to perform JAL original music just for the flights between Japan and Honolulu (note that the English press release states this is only available on the Tokyo - Honolulu route which contradicts with the Japanese version and we all know which one is correct :P) The new music will be available from October 1 2013. 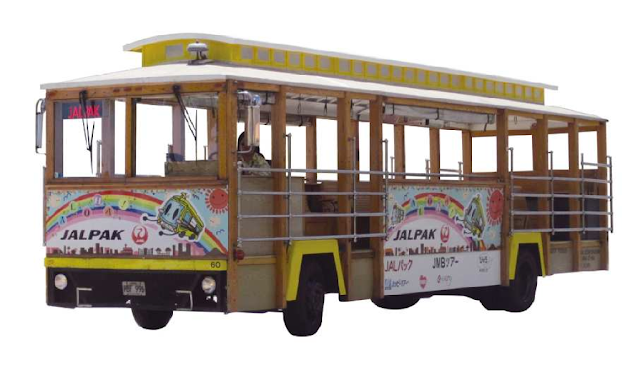 Free JALPAK trolly ride. Image by Japan Airlines. JAL has been running the JAL OALO CARD campaign for a couple years now. With this card, you will be able to get discounts and free JALPAK trolley ride in Hawaii. JAL will now expand this service to everyone who bought personal air fares or JAL Mileage Bank special fare on the Honolulu route (or at least has announced this in English in some way if it was available to those passengers before :P). You can find the complete list of participating merchants on http://jaloalo.jp (Japanese only).